Roulette provides high payouts for its winners. Players must understand principles of all betting systems and mathematical odds associated with them. The important thing one should know and understand first of all is that there are 2 different types of Roulette: American and European. The difference between these two Roulette types is that American type has 36 numbered colored slots and two zero pockets, and its European counterpart has only one zero slot. Actually it makes a notable difference between the odds of each type of the game. One more important fact a player should know about Roulette is that in comparison with different bets which have different payout structures and odds the house edge always remains constant. It is the advantage of the house on every wager placed. And of course, American and European Roulette have differences between the house edges. Double zero Roulette odds are considered to be worse in comparison with single zero Roulette odds. Taking into consideration the fact that the table of double zero Roulette has one more space, one should understand that this small addition makes the house advantage bigger. 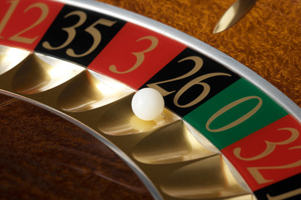 Placing the bet on any Roulette wheel number one will have 36:1 winning odds. Placing a split bet (2 numbers) one will have 17.5:1 winning odds and 17: 1 payout. Street bet (3 numbers) - odds are 11.33: 1, payout - 8: 1. The odds for Column or Dozen bets are 2.08: 1, and the payout is 2:1. A square bet (4 numbers) - odds: 8.25: 1; payout: 8:1. Even money bets: red or black, odd or even, low or high. The odds for these bets are almost 50/50. The payout for every bet one can make is less than the odds. This is the house advantage, a small mathematical difference which allows all casinos to make money.